George Washington Sterling Medal (Wittnauer Mint, 1972) Current Market Value. 40mm, Antique finish, high relief, solid sterling silver medal. Displayed in large Lucite holder. 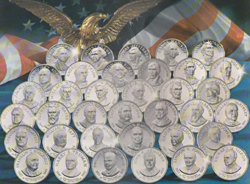 Obverse of medal features a bust of the president with the name at top of medal and date range representing the years in office at the lower portion of the medal. 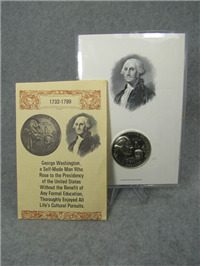 The reverse of the medal features a brief historical profile of the president, with the life span at the top.